Cantonese-style street food comes alive at Clay Pot. Grab a seat at the counter (shoulder-to-shoulder as they say) for the full experience. Watch as the chefs cook individual clay pots filled halfway with jasmine rice. 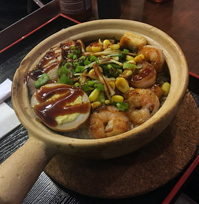 As the rice steams, additional ingredients are added, including spinach, corn, tofu and soy egg. Diners then choose at least two proteins ranging from beef and pork belly to Chinese sausage, baby prawns and eel. A vegetable option is also available. The price depends how many toppings you choose. The bowls are then allowed to cook until the rice starts to crisp up. What arrives in a delicious one-pot meal. Be sure to scrape off all the crunchy rice bits on the bottom of the bowl mingling with strands of fresh ginger and a special sauce. It's wonderful. Other small plates including pan-seared prawns, scallops and whole squid are also offered until they run out. We found the service to be super friendly and helpful. Clay Pot is more than just a meal, it's an adventure.